Home / Case Results / Queens Intersection Accident Lawyer Review: Desroy G.
Queens Intersection Accident Lawyer Review: Desroy G.
On October 31, 2016, Desroy was driving on 110 Avenue and was approaching the intersection of 175th Street in Queens, New York. Since Desroy had the right-of-way through the intersection (no stop signs), he proceeded to drive through the intersection and was struck (t-boned) by a vehicle that ran the stop sign and did not yield to Desroy. The airbags in Desroy’s vehicle deployed and he felt his right leg get stuck between the pedals during the collision. The accident caused Desroy’s vehicle to swerve and strike an unattended parked car. He immediately felt chest pain from the airbags and pain to the right side of his body. Desroy was taken by ambulance to Jamaica Hospital. As a result of the accident, Desroy injured his back, right shoulder, right knee (required surgery) and right ankle (required surgery). Although Desroy had the right-of-way, the other driver claimed that Desroy was speeding and caused the accident. The other driver also pointed out that Desroy damaged a parked car to make him appear even more guilty in the police report. Desroy didn’t know what to do, so he hired a personal injury lawyer to help guide him through the legal process. After weeks passed with no progress on his case, Desroy considered hiring a new lawyer. Thankfully, Desroy was referred to Adam Handler – The Case Handler! 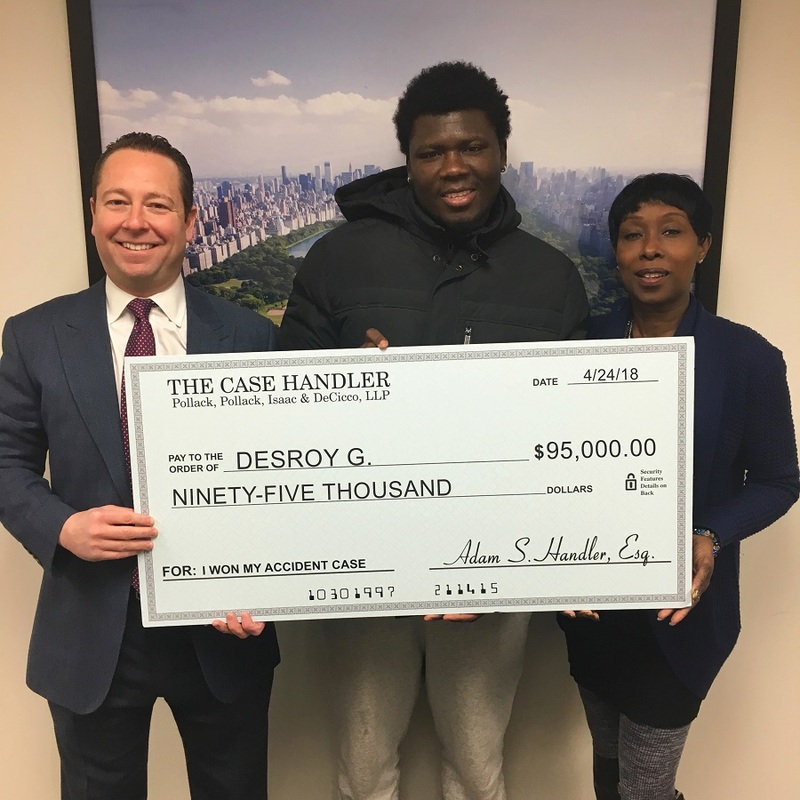 Desroy moved his case to The Case Handler team and our experienced Queens intersection accident lawyers helped prove that the other driver indeed failed to yield right of way and not lookout for passing cars properly. Although the other driver’s insurance company (Allstate) refused to take any liability for the accident, The Case Handler team still recovered $95,000.00 from Allstate Insurance!